Warm weather is a special time for my two neighbors, Hershey and Hope. Hershey is a chocolate labrador; Hope is a golden retriever. Both dogs live with Alison and Ryan, two Missouri S&T students who spend most of their days either in classes or books. Unless they are taking their dogs for a walk in the neighborhood, when I usually see them. Hershey in particular will make a mad dash for my house, sometimes beating me to the garage as soon as he sees my car turn the corner down my drive. One weekend when I was babysitting the dogs, I took them to a local ice cream place for doggie cones. One year later, they still remember that trip, barking at my car door to let me know they are ready to take another ride. Since we can't always do that, I started making homemade doggie cones for them. So easy! Using pre-made sugar cones, I fill them with light vanilla ice cream through the whole cone and put them in a freezer bag in the freezer. Initially I was freezing them separately but it's easy enough to pop them in a freezer bag all at once. When I have barking visitors, out come the cones for a quick treat. People need ice cream treats, too! Hope inhales his ice cream cone but Hershey takes his time. Sweet, don't you think? After composting all those outdated spices, save the glass jars for gifts. First, soak the jars in soapy hot water to remove stickers. Wash jars and lids in dishwasher a couple of times to remove any residue. Allow jars to air without lids for a couple of days. Check to make sure jars are clean and without any residual scent. You can use these jars to make homemade bath salts; BBQ rub; saltless seasoning and to store your very own dried herbs from your garden. One of my friends returns her empty jars every summer and tells me what dried herbs she would like for Christmas. By the time the holidays come around, she has forgotten what she asked for and is always delighted with what she gets! 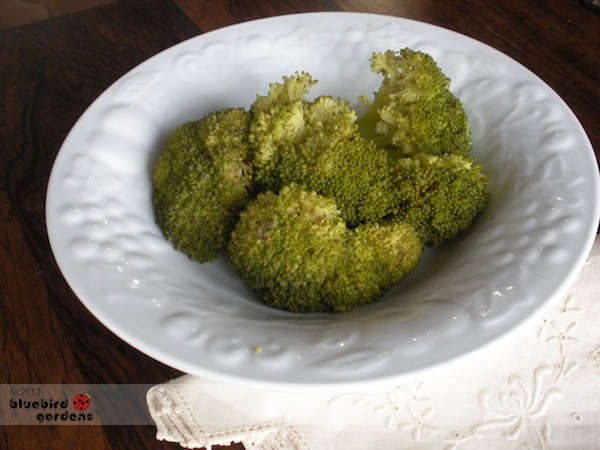 Broccoli is one of my favorite vegetables so I keep it around steamed so I can easily use it in a variety of dishes. 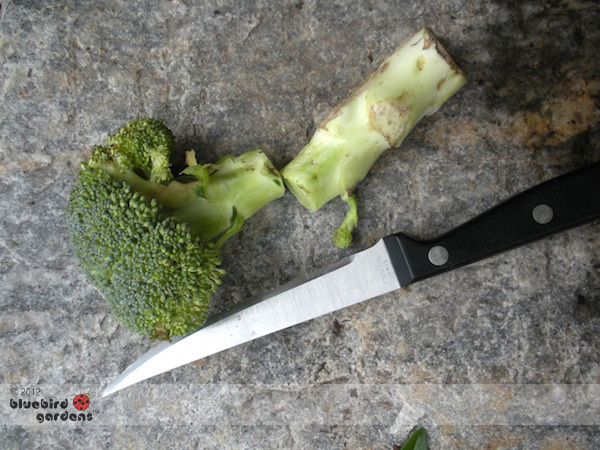 To easily steam broccoli, wash and pat dry with clean dish towels or paper towels. Cut off the thick stem until the top florets look like trees. Add to a steamer and steam until starting to get tender. Quickly remove from pot so cooking doesn't continue. Store in covered containers in refrigerator until you need to use it. Do you have a favorite way to steam broccoli?